A vital link for walkers and mountain rescuers heading for Highland munros has been reopened. 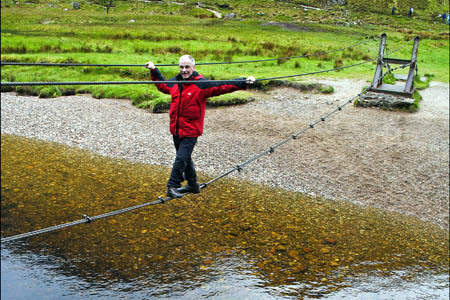 The wire bridge at Steall, Glen Nevis, has been out of action for three months after a cable snapped on the bridge, which crosses the Water of Nevis. The bridge lies on the route to the munros An Gearanach and Stob Coire a’ Chairn, and the munro top An Garbhanach. The John Muir Trust, which owns the land, has reopened the bridge after a party of walkers overloaded the structure and caused one of the cables to break. Andrew Campbell, head of land management for the trust, said: “We’re delighted to announce that repairs to the bridge have been completed and it is now safe for people to cross. “The bridge provides a vital link to the Steall bothy and the Mamores both for recreational visitors, and the Lochaber Mountain Rescue Team. The trust warned that some routine maintenance work is taking place and that walkers are advised to check with the Glen Nevis Visitor Centre before when planning to use the route.